In a campaign to increase exposure about Korea in the US, the Korean Tourism Organization sponsored a Korean cooking challenge, pitting top non-korean chefs from OC, La Jolla, and Tijuana to see who has the best interpretation of classic korean dishes. The contest was hosted by Cathlyn Choi (from the TV cooking show Cathlyn's Korean Kitchen), and sponsored by buzz KOREA, the tourism organization's global campaign. 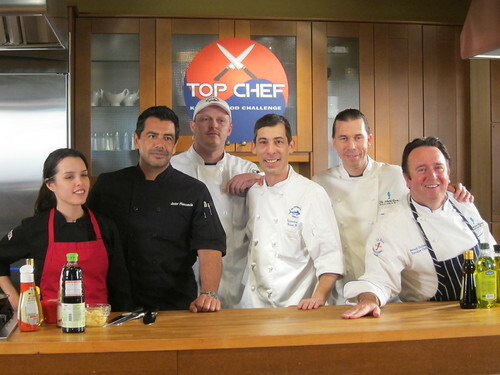 Competing chefs: Javier Plascencia and Adria Montano (Villa Sorriso, Tijuana), Bernard Guillas and Ron Oliver (Marine Room, La Jolla), Brian Hirsty (Bluewater Grill Tustin) and Graham Norton (Bluewater Grill Redondo Beach). The show will air on SoCal PBS station KOCE April 7 at 9 pm and starting the first week of March, you can vote for the chefs team that you think should win on the Buzz Korea website. To help you decide on who should win, below is a recap of my experience during the shooting, tasting the different dishes, etc. I can't tell you who won though. While they were setting up, we had a catered lunch - korean food, of course. Japchae, bulgogi, and one of the best kimchi I've had lately. I also tried kkulttuk (honey rice cakes) for the first time and loved them. 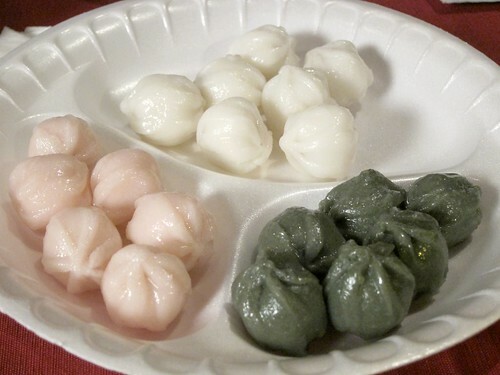 They're these bite-sized chewy balls made of rice and filled with honey. The judges: Barbara Hansen (a veteran food and wine writer in Los Angeles), Korean actor James Kyson Lee (Heroes, CSI), and Cecilia Lee (author of Quick and Easy Korean Cooking), and then there were some bloggers also judging on the sidelines, including myself. The chefs are divided into 3 groups: red, white, and blue, to represent the Korean flag. 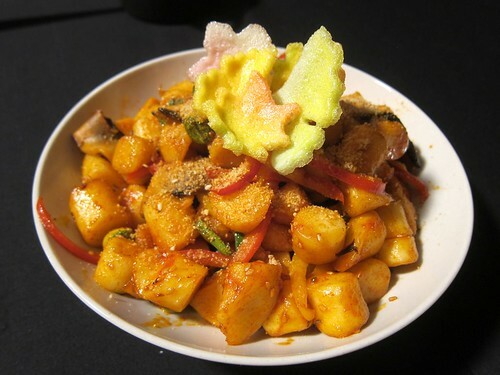 Each chef draws the dish they will make out of 6 options: Kalbi Chim (kalbi stew), Ttuk Bokki (spicy rice cakes), Daak Kalbi (chicken stew), Bibim Bap, Gu Jeol Pan (a royal dish for 9 delicacies), and Kimchi. Each team has 30 minutes to prepare their dishes. First up was the Red Team : Chef Javier Plascencia and Chef Adria Montano from Villa Saverios, Tijuana, B.C. Mexico. I've been to their restaurant in Tijuana and had a great meal, but of course I don't know how familiar they are with Korean cooking. Chef Adria Montano didn't know what dak kalbi was before this, but they pulled the dishes together. Chef Javier's kalbi chim with pinenuts was sweet and lightly spicy. 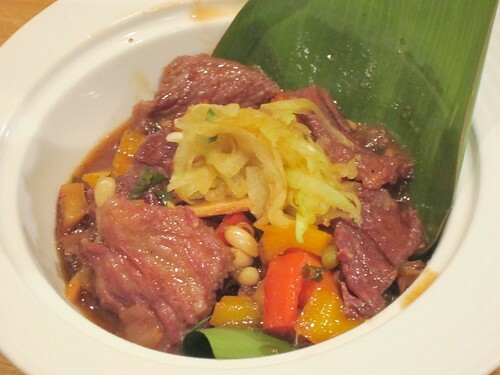 Great complexity in flavor in this stew and the meat was amazingly tender. Unfortunately, I thought the chicken in the dak kalbi was a little tough and dry. 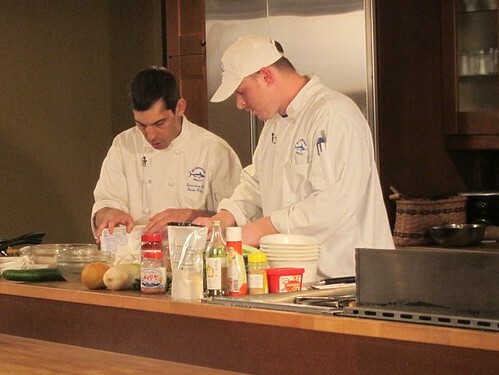 Next is the White Team : Chef Bernard Guillas and Chef Ron Oliver from Marine Room, La Jolla. These two chefs have worked together on a cookbook featuring various international dishes, and were quite familiar with korean cuisine. They drew bibimbap and ttuk bokki. 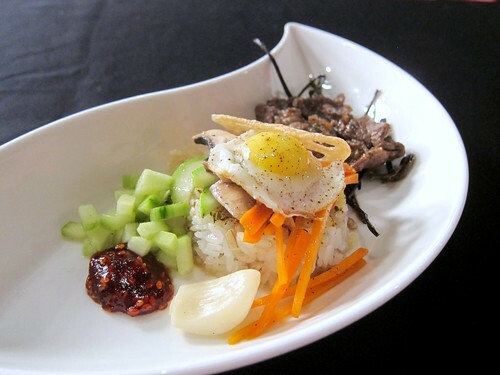 Chef Guillas said that he makes bibimbap at home all the time and knew the flavor profiles well. They worked together well and seemed used to cooking and talking in front of the camera, making their 30 minutes entertaining and informative. As they could not serve the judges individual bibimbap in clay pots, they had to think of another way to get the same texture as the burnt and crackled rice. To do this, they added fennel to the rice, pad the rice into a lump and quickly sear it. Since the tasting portions are much smaller than usual, it is topped with a quail egg. 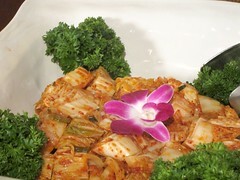 Their ttuk bokki had a great texture also. 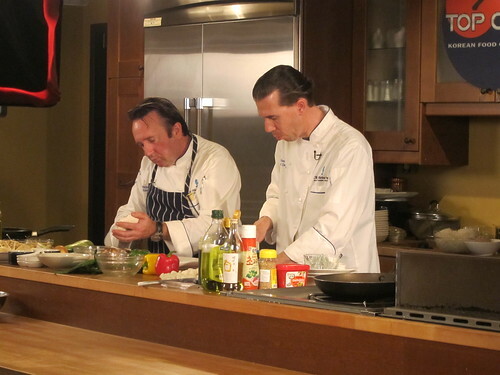 Blue Team : Chef Brian Hirsty from Bluewater Grill Tustin and Chef Graham Norton from Bluewater Grill Redondo Beach. I think they got the short end of the stick by drawing kimchi and gu jeol plan. I can imagine how tough it will be to make a "dish" consisting of nine dishes and kimchi which normally requires days of fermenting. Naturally, they couldn't really make kimchi so Chef Hirsty ended up making a kimchi "salad" which did in fact capture the essential flavors of kimchi. 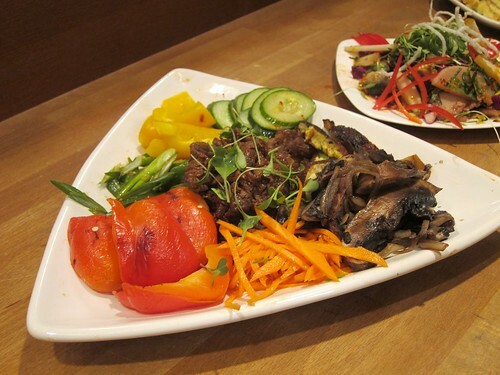 The gu jeol pan was a colorful assortment of vegetables and meat, served with some thick egg crepes. The winning team will get round trip tickets to Korea plus some spending money. So who do you think will win? Remember to cast your vote between the first week of March and the show air date on April 7! Hi Fiona - great recap of the event!! Gina Lee & I sure had a great time, so nice to see you there. I'm glad you included the buffet in your post, that was actually quite lovely.